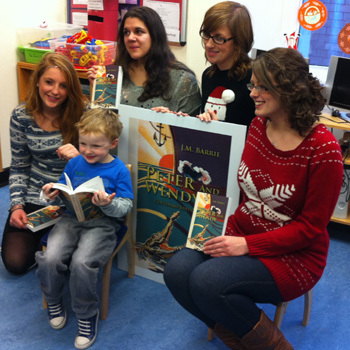 Edinburgh’s sick children got a dose of Christmas cheer yesterday when 100 free copies of children’s classic, Peter and Wendy, were delivered to the Royal Hospital for Sick Children.The much loved tale about the boy who never grew up celebrates its publishing centenary this year.And to mark the milestone MSc Publishing students from Edinburgh Napier University have produced a new edition of J.M. Barrie’s magical tale. The book has been published with the permission of Great Ormond Street Children’s Hospital, who Barrie gave his Peter Pan works copyright to in 1929. Avril Gray, Programme Leader for Postgraduate Publishing at Edinburgh Napier University, said: “The new book will be delivered to children’s hospitals across the UK to bring the magic of Peter Pan to children at a time when they often feel sad or afraid. Janice MacKenzie, Chief Nurse, Royal Hospital for Sick Children said: “We are delighted to be the first hospital to benefit from this lovely gift. The centenary edition of Peter and Wendy has been published by Merchiston Publishing – the imprint of the Scottish Centre for the Book based at Edinburgh Napier University. The University now offers two masters in publishing – MSc Magazine Publishing and MSc Publishing. This year MSc Publishing became the first and only publishing course in the UK to be accredited by the Periodicals Training Council. Posted in Headlines and tagged Edinburgh Napier University, MSc Magazine Publishing and MSc Publishing, Peter and Wendy. Bookmark the permalink.